After a series of technical scans, the satellite moon's initial analysis revealed the presence of all basic essential elements necessary to sustain life as humans were accustomed to. 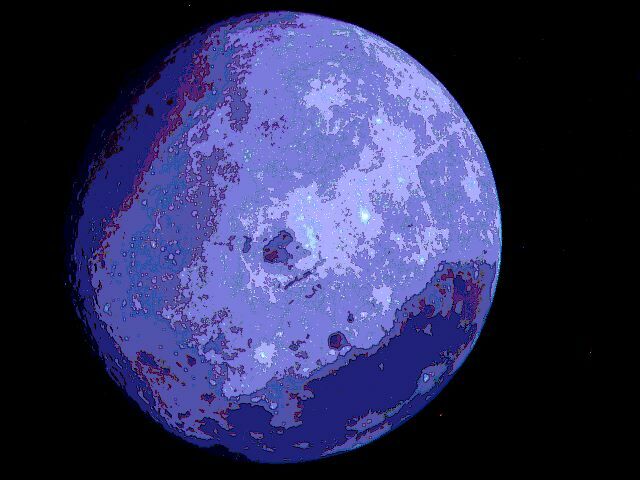 The instruments then relayed an enhanced configuration of the captive moon bearing a remarkable resemblance to a spiral seashell found on the sandy beaches of Earth. The anxious couple decided to explore this "shell" immediately to determine if it was potentially habitable. If not, they were surely doomed to spend the remainder of their short lives aboard the New Hope, as the next information emitted by the vigilant computer proved to be a code-red danger signal warning them that Earth's wayward moon, on which they were resting, had overcome the gravitational pull from the lifeless planet resulting in a direct, final collision course with the apparent sun of this entire solar system! The massive gravity had already started the moon's acceleration, and the situation dictated the dire necessity to blast off quickly to insure the safety of all occupants on board. Abe initiated a three minute countdown while he and Babe hastily secured the rest of the ship. The New Hope vacated the ill-fated surface easily on the main engines. Abe fired the directional retro rockets on Babe's signal to enable them to achieve a concise, shallow orbit around the strange new satellite moon. Their powerful sensors could then thoroughly scan and analyze the intense blue surface below. The hopeful couple jointly decided to take the ship's commuting shuttle down for a closer look after the favorable initial report. The orbital scan had shown the surface to be saltwater beneath a thin, striated atmosphere composed of helium, nitrogen, carbon dioxide, oxygen and trace elements of argon and other assorted gases, none of which were deadly. The sleek, compact shuttle hovered easily above the surface water while collecting the required data. The oxygen content proved to be much higher than that of Earth. Also, the gravity equalled only one third of the standard range. The weak gravity factor allowed them to expend only part of the usual energy necessary to keep the craft flying. The major problem at hand seemed to be that of locating a suitable source of drinking water, or to improvise a practical way to convert moderate amounts of saltwater by evaporation and condensation back to fresh-water. Long-range scans had not disclosed any pure water either. A cargo carrier from Earth was to have supplied them monthly with water while on the moon due to the bulk of food stores and scientific equipment mandatory for the success of the primary mission. It would soon become imperative to find or distill drinking water. Abe and Babe decided on returning to the New Hope to enlist the aid of the master computer. Later in the day, further scanning revealed a perfect line running vertically down the back side of the moon. The satellite moon would pivot on its own axis one full turn with each complete orbit of the planet. The line would only be visible approximately half of the complete orbital time span. Intensely focused narrow beam scans presented possible signs of life! Hope was rising once again. Amidst the favorable new possibilities of their latest discoveries, both Abe and Babe exhibited extreme worry concerning the growing young embryos. At present, they had no way to isolate the component malfunction within the vital education circuits. Self-initiated computer diagnostic deployment scans had also turned up nothing. The couple was terrified at the prospect of babysitting a group of physically "adult" adolescents which were mentally incapable of performing even the most rudimentary functions of normal, everyday life. Just the simple thought seemed a mentally staggering blow. They had little choice but to wait and hope for the best regarding that particular situation. In the meantime, the pair would explore and record the watery moon glistening beneath them and possibly devise some method to inhabit it. On the ninth orbital crossing of the vertical line, Abe's keen eyes discerned a tiny glitch in the computer read-outs. By backlogging and overlapping the previous scan values, he discovered an almost imperceptible "edge" of fresh water! He and Babe must visit the surface again at the exact longitude of the line to determine if somehow it was different from the surrounding surface area. Despite the mounting tension, Abe conveyed to his mate a reassuring sense of security. He was infinitely the stronger of the two, and it was his responsibility to use his enhanced wisdom to make the final decisions which had a direct bearing upon the course of their lives. He vowed to himself that they and the "children" would survive, regardless of the inhospitable circumstances. Babe knew this by basic instinct. Abe's thoughts correlated with her own and vice versa. Harmony still ruled within the confines of their spacecraft home. Duties performed, Abe and Babe set about preparing the shuttle for its most important mission to date ..... the perseverance of life itself. Life support on the New Hope would not hold out for the mere nine months it had been designed for. Loss of oxygen from the damaged tank had critically altered the pre-determined time/need factor. After feeding time for the animals and a minimal watering period for the plants, the couple met in the central hall to telepath speculative thoughts on the topic of how life might survive, should they find any on the surface below. Satisfied with their thought discussion, Abe and Babe commenced preparations to journey to the "lifeline", as they had nicknamed it. They jointly performed a routine check on the growth chambers before departure. Unfortunately, there was no change. System status still blinked its pitiful red beacon. Even though Abe and Babe accepted the fact, a certain amount of depression connected with the electronic knowledge malfunction remained. If necessary, they would gingerly nursemaid the adult embryos until they were effectively trained for survival in the new environment. Abe fired the retros while programming a course for the moon's surface. Success of this mission escalated above the important stage. From the edge of the thin atmosphere, the light blue surface of the moon glistened brightly with a huge, reflected image of the orange sun. Coasting into the puzzling lifeline coordinates, the couple realized quickly why the previous analysis had been so vague. The entire line materialized into one continuous, magnificent waterfall! Their craft hovered momentarily above the churning tail-waters while Abe and Babe mentally discussed the possibility of a large cavity behind the towering falls. A close-range scan produced faint, scattered botanical lifeform readings! The signals originated behind the deluge of plunging water, leaving the explorers no choice but to risk an entry into the torrent. The excited couple scarcely breathed as Abe cautiously applied 30% more lift capacity to compensate for the tremendous anticipated downwash of water pressure and slowly nosed the sleek shuttle into the raging falls.